A couple of things I hadn’t realized: That I believed Hobbits to be white, and that there was clearly and obviously something wrong with that. I’m not going to get into a dorktacular Tolkien debate about it, but I asked a few of my Pals Who Know Their Tolkien, and it does appear that some Hobbits might have a darker skin tone – a certain variety which dwell near the mountains, and are related to dwarves. But the Hobbits in the upcoming film The Hobbit are from The Shire, and in a quick Dork Summit, a few of us put our heads together, and we’re pretty sure that the Hobbits of The Shire are specifically described as being fair-skinned. They’re little white people with big hairy feet, who like to eat a lot and take naps. See? Cartoon images of fictional characters do not lie. So it was quite a surprise when I saw that this casting director right here was just fired from the set of The Hobbit for specifically calling for “fair-skinned” actors to play extras in the film. In particular, a woman of Pakistani heritage was told that she wasn’t suitable to play a Hobbit because of her skin color. It’s not that there couldn’t be a black Hobbit – I almost said African American Hobbit just now, but that doesn’t make any sense, does it? – It’s just that they’ve spent about a hundred million dollars building the actual Hobbit town in New Zealand, building it in painstaking detail right down to center-mounted doorknobs. Tolkien tells us more than what the Hobbit’s houses looked like and how many meals they ate and what they were good at – he told us they were, in The Shire at least, a fair-skinned people. We’re going to holographically replicate his whole world down to a hundred thousand tiny details, except we’re then going to inject it with our own multicultural ideals while we’re at it? I mean, sure – knock yourself out. It’s not like Hobbits of Color, or Asian Hobbits, or Hobbits Who Appear To Be From Pakistan – it’s not like any of that would bother me. It’s just that I don’t think this guy was doing anything sinister when he made his assumption that they were looking for little white people. He’s not trying to be…. whatever. See how he even starts to address the racial issue, and then realizes he’s talking about motherscratching Hobbits, and says for crying out loud, what’s the problem here. You show up with a green, two-foot mohawk and you’re not getting the Hobbit job either. I mean, it is? Allegations of pervasive skin-tone accuracy in your selection of Hobbit extras? You know, I guess if you’re a hundred million dollars into it, you probably take about everything Very Seriously Indeed, but I don’t know how long I could discuss this in a meeting without cracking up. I think I’d be sitting in a bar with the casting director and no job. So, let’s say you’re casting a movie, and you need a hundred extras to be Zulu warriors. And then I show up, and you tell me, Tom, dude, you’re white. Zulu warriors are definitely not white. And it would be pretty offensive to, you know, paint me or anything. Seems to me like I’m just not really qualified for that job. I’m probably not the right guy to cast as an extra in a movie set in Mongolia, either. Can I really sue you for that? In other words, I think it might be okay to turn people down for acting jobs based on the color of their skin, if it’s the plain old wrong color for the part they’re after. Jeff Bridges is a great actor, but he’s just not right for the part of Malcom X. He’s not even on the list, because he’s white and it’s not that complicated. Now there are a lot of minute details in Tolkien’s work, so it’s possible that I and my Dorktacular Hobbit Information Squad have missed something, and he does allow for Hobbits of Color. And again, Jackson feels free to change whatever he wants to change, anyway. That’s why you probably don’t know who Tom Bombadil is, or if I spelled it right just now. 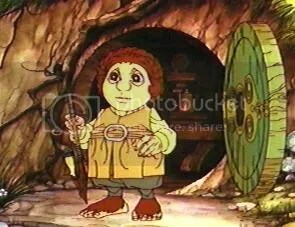 I mean, the new, multicultural Hobbits are still going to dress and act like Hobbits, right? They’re not going to be like jive-talking Hobbits, or Hip Hop Hobbits, or anything like that? Cool. So then really, I don’t see the problem. Except I still don’t understand why this guy is in so much trouble for saying, come on dudes, we’re looking for little white people. He just knew what Shire Hobbits looked like, that’s all – it was his job, you know. Probably they got the word out pretty quick, so I don’t think it’s going to happen again, and the only people who are going to notice that not all of the Hobbits in the movie look exactly like they’re from The Shire are going to be me and my Dorktacular pals, and we’re reading you loud and clear. Authenticity is one thing, but there’s no reason to be a bunch of White Hobbit Supremacists. Excellent, then. Proceed with your movie-making, Mr. Jackson. *Photo not actually from National Geographic. Come on, now.